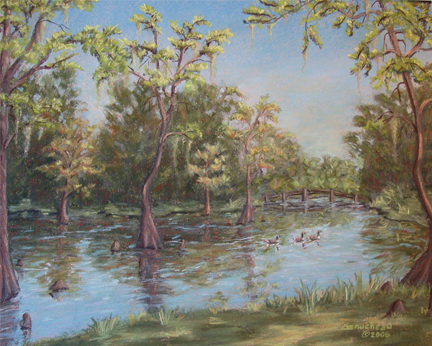 Pastel pleine-aire painting of cypress trees in Greenfield Lake in Wilmington, NC by Rose Ganucheau. I suppose Greenfield Lake was once a tidal creek leading into the Cape Fear River, but a damn keeps it fresh now. 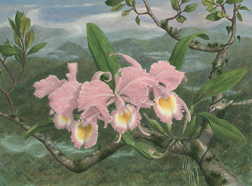 The many fingered lake is bordered by a walking path and is a profusion of azaleas and other flowers in the Spring. I was surprised by how red the cypress trees were in springtime. The geese are a common sight and it is a frequent roost for American Egrets.